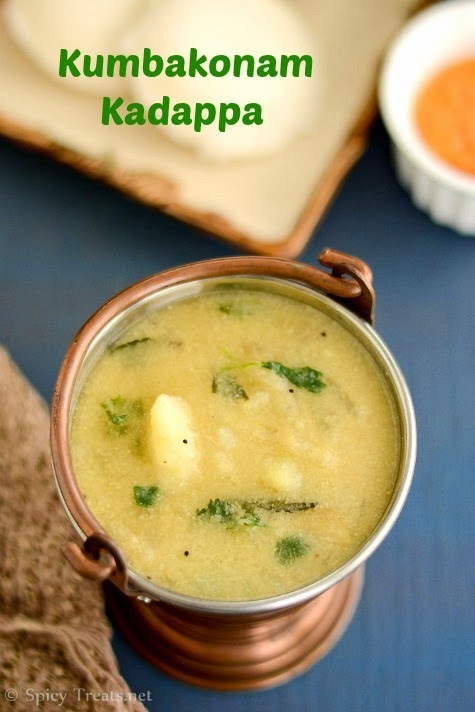 Kadappa is nothing but a stew or kurma prepared using potato and yellow moong dal and served as side dish for Idli/Dosa. 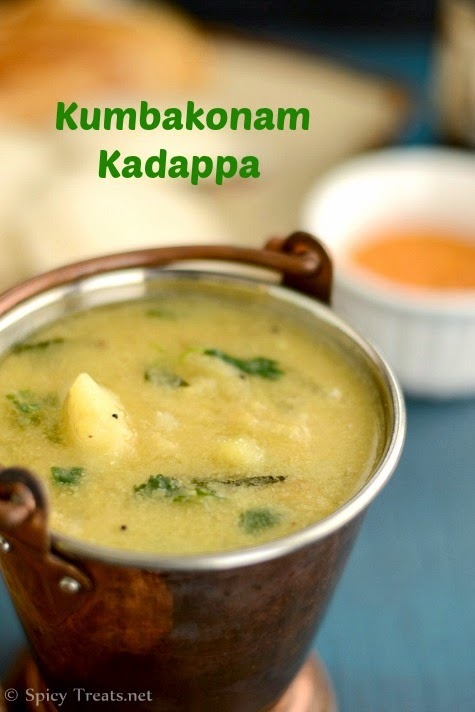 Kadappa is popular in Kumbakonam and thus it is mentioned as Kumbakonam Kadappa. 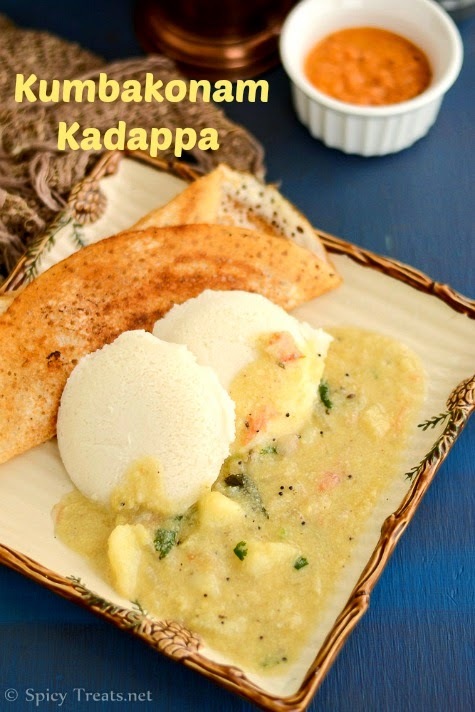 Kadappa is one the delicious accompaniment for Idli & Dosa. Moongdal, potato and coconut paired well and this is a less spicy, rich and flavorful curry. 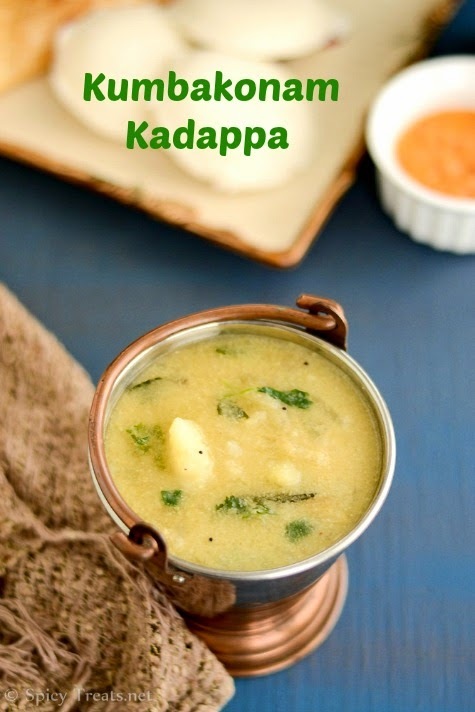 My mom never cooked this kadapa and I came to know about this name and recipe only from other cooking blogs. Long back, tried this Kadappa from Nalini's blog and loved it a lot. First time, I tried with whole moong and it turned out great with lovely flavor and taste. I even tried a similar version of Kadappa with Oven Roasted Cauliflower and Green Moong Dal Curry for Rotis and posted here. Wash and peel potato and cut into cubes, pressure cook cut potato cubes, moong dal together with enough water for 1-2 whistles. After that slightly mash dal and few potato pieces and keep aside. Heat oil in a pan, add the tempering ingredient one by one and allow to fry well. Then add sliced onions, slit green chili, curry leaves and chopped garlic and saute for 2-3 minutes. After that add chopped tomato and saute for a minute. Now add the pressure cooked dal and potato, 3/4 cup water, stir well and bring it to boil. Mean while grind coconut, fennel seeds, green chili, garlic with little water to a smooth paste. Once moongdal starts boiling add the coconut paste, enough salt and water( to desired consistency, the curry thickens uopn cooling so add water accordingly) and cook covered for 1 boil or until the raw smell leaves and switch off the stove. Lastly add lemon juice and finely chopped cilantro and mix well. 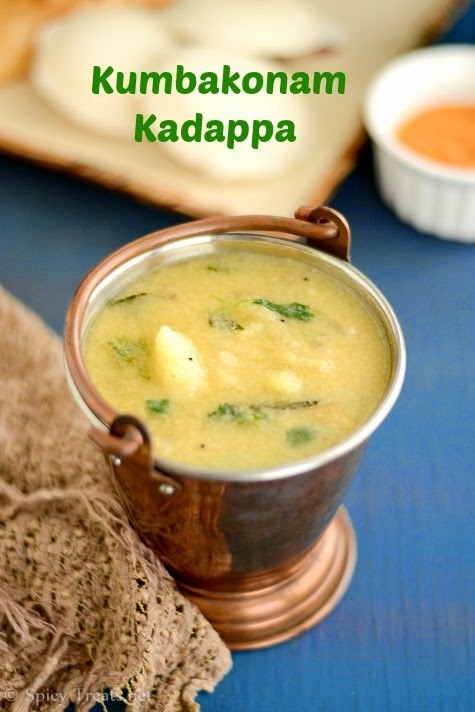 That's it...Delicious and flavorful Kadappa ready, serve with hot Idli & Dosa. Use half ripe tomato or you skip tomato and add extra tsp lemon juice. Do not add more garlic one fat garlic or 2 small ones is enough. Or else the taste would vary. Because of moong dal and potato the curry tends to thicken after cooling, so make it in thin gravy. The real color of Kadappa is bit lighter than in the picture. seeing this always brings back my hostel memory.. This is one dish I always look fwd to have it in our hostel canteen.. Yum! Lovely clicks.. This is on my list to try for long time.. Looks really delicious..
Beautiful curry Sangee one of my favorite, yet to blog about it :) love your clicks too good and makes me hungry. Looks great, hearing about it for the first time and tempted to give this a try. Beautifully made Sangee, fav combo with steaming hot idlis... drooling here! Sounds so flavorful! Great recipe to brighten the cold winter days we 're knowing here! I have never had this before but will soon be making it. Thanks for the recipe.